Double growth after 2 years, Cho Lon is the only electronic chain can still chase fiercely with Dien may Xanh. After The gioi Di dong – with 2 chains of Thegioididong.com and Dien may Xanh – has established a dominant position in the electronics retail and mobile equipment industry, the race for No. 2 or No. 3 in the industry becomes a “vital issue” for other electronics chains if they want to continue to exist. A typical example is Tran Anh – a large electronics chain in the north. Having seen no advantage in the race for the top position in the industry, the company’s board decided to resell to The gioi Di dong. Vien Thong A is also said to be completing formalities to “sell itself” to a large domestic group seeking to increase its position in the electronics industry. Vien Thong A ended the year 2017 with sales of VND 4,600 billion – down 5% over the previous year – and relatively small compared to the revenue of 13,100 billion from FPT Shop or VND 35,000 billion of Thegioididong.com. If the retail segment of mobile devices has only a few large chains, the array of electronics has many brands competing fiercely. The strong acceleration of the Dien may Xanh makes the rest of the business that does not have much potential to grow. 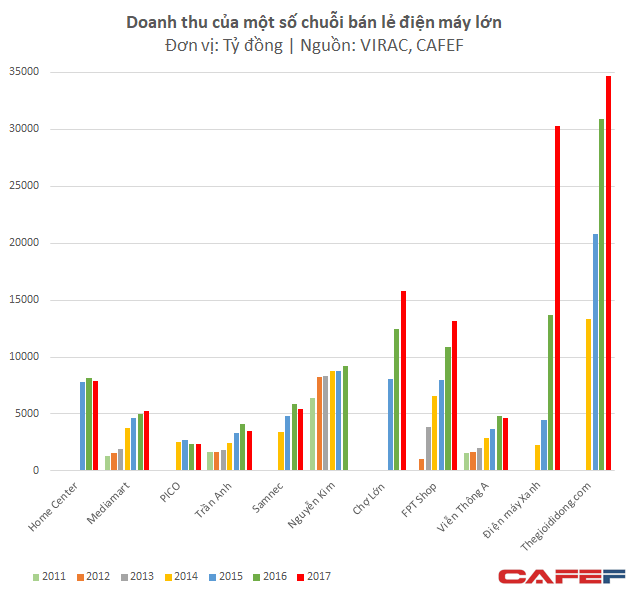 If in 2014, the revenue of the Dien may Xanh has just reached 2300 billion but in 2017 it was nearly VND 30,300 billion. Nguyen Kim has had a long time as the “eldest brother” of the electronics industry but has stagnated in a confusing way for many years with turnover going flat, not exceeding the threshold of VND 10,000 billion. As a result, Nguyen Kim had not only loses the leading position but also took the second place in the hands of another rising opponent, Dien may Cho Lon. Have not mentioned much like The gioi Di dong or FPT Shop, but Cho Lon has impressive business results: 2016 revenue increased by 54% from 8,100 billion to 12,500 billion and continued to increase 26% in 2017 to VND 15,800 billion – more than the revenue of FPT Shop. Double growth after 2 years, Cho Lon is the only electronics chain can still chase fiercely with the Dien may Xanh. By focusing solely in the South, Cho Lon is clearly one of the most desirable competitors of the Dien may Xanh in this area. However, narrowing the gap with the Dien may Xanh is very difficult when in the first 7 months of this year, revenue of this chain continued to increase 84% to nearly VND 29,000 billion. Cho Lon has 59 branches nationwide, mainly in the South with 27 branches in Ho Chi Minh City and surrounding areas; 20 branches in the West and 12 branches in the Central. Meanwhile, the Dien may Xanh has expanded throughout the country with 727 large and small stores. 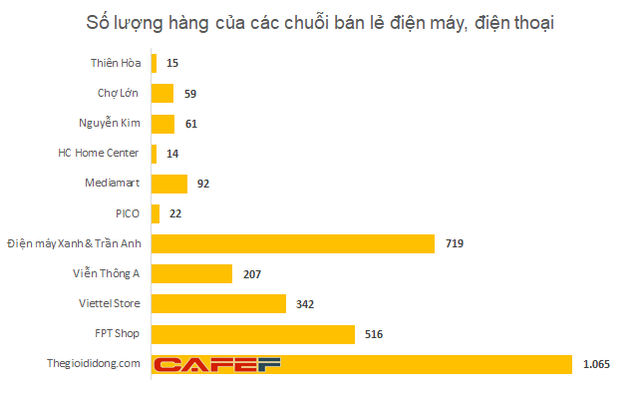 While the two leading chains are high growth, the business of other electronics chains is not very bright, especially large chains in the North such as Tran Anh, HC Home Center, Samnec or PICO. Revenue of all 4 chains was down in 2017. Mediamart has invested strongly in network expansion but revenue growth is very low, reaching more than 5,200 billion in 2017. By the beginning of September 2018, Mediamart has 92 stores. With the market share shrinking due to low growth and even negative growth, the profit problem is also a big pressure on the chain. Samnec or Mediamart has a pre-tax profit of less than VND 500 million in 2017. PICO and HC Home Center are quite brighter but only reached VND 25 billion and 14 billion respectively. Even FPT Shop and Cho Lon have a profit of several hundred billion dong but still small when placed next to The gioi Di dong’s 2.800 billion profit.